Due to level spread, Tonia will be awarded XP as if she were fifteenth level. Kara lacks the XP for defeating the Hooked Horrors, as she had to leave for a while. Discretionary bonus XP has been awarded to round out numbers and reward players for enduring a long quest, with many trials along the way. Duanda Beads (Grimm) - An encyclopedia of martial arts style from all over the world. Contains most, but not all styles of martial arts in Therafim, and a few from outside of Therafim too. Any style encountered during combat will be assimilated into the Duanda beads, and is able to be reviewed in meditation at any point thereafter. Using the Beads as part of a training regime greatly expediates the process of cementing knowledge, allowing its posessor to master far more martial arts than would normally be possible in the course of a single lifetime. Foot tall glass cylinder capped on both ends with brass and filled with yellow mist. A ghost prison containing ghost has ghostly faces visible within the mist. Any ghost that comes within 10ft of it must make a DC 17 save each round or be pulled entirely into the cylinder and be trapped until the cylinder is destroyed OR until someone speaks the ghosts name -at which point it gets a new save, but no more than 2 attepmts may be made per day. If a ghost prison is destroyed, any ghosts within it are slain. A ghost prison holds up to 5 ghosts (either at the same time or sequentially). After the 5th ghost is freed, the cylinder shatters and the item becomes nonmagical. The various trappings of the Grand Master Oogway still retain the imprint of their masters legendary martial genius. By wearing the trappings of Oogway, any person no matter their background will feel the spirit of combat flowing through their veins. You become one with the energy of the world itself, able to sense even the most minute of changes around you. Any Monk that wears the trappings of Oogway may expend a use of Stunning Fist to align their spirit in attunement to one of the prime elements. This gives the martial artist the ability to deal their full unarmed damage in elemental damage: Fire, Water, Lightning or Acid for one round. This ability may activated as part of an attack or full attack action. One with the Universe: Cannot be surprised - gets to act normally in surprise rounds, Blindsight to 10ft. The result of a twisted experiment by a Drow Household, Grimm was allowed to serve only because he was a near success. Born as one of a set of three, he embodied the virtues of 'good,' while his siblings were paragons of neutrality and 'evil' respectively. Much has happened since the Turos experiment was cast out of the House that raised him, and the mistress he was closest to was slain in front of him. Although he was left for dead, he survived, bore children. The code of conduct he adheres to is strict, a champion of 'good,' in pursuit of enlightenment. Combat is in his blood, martial skill, tantric discipline, it is what he knows and part of what has supported him through his years. Grimm, Kara, Tammuz, and Tonia thus headed in search of Gast. Their journey was not without peril, even before they arrived at the site of their adventure. They landed with a crash, some miles away from Aranea Falls, a spot on the edge of a notoriously dangerous mountain range, the Harkness. While not especially tall as peaks go, the Harkness mountain rage is extremely craggy and treacherous, and prone to some of the worst weather on the Autumn Land continent. It is a noted dwelling place for a variety of terrifying creatures, especially the undead, as well as a site for various evil acts, performed by deranged cultists. The entire range is noted as being an unholy site, though there are a few monasteries manned by especially brave and holy crusaders against darkness. While the crash was undoubtedly unpleasant, they arrived more or less unscathed into a hot, sweaty, unpleasant environment. It all looked rather nice though, panoramic. During their trek to the falls, they had to duck out of the way of a viscious looking Roc, larger than any they had seen before and fast enough to leave a shockwave full of dust and debris behind it. Signs of nature were everywhere, but they didn't really see many big animals, only mosquitos. The mistake of squishing a few let to several swarms of football sized Hell Mosquitos descending upon the group for bloody revenge, it didn't end well for them. When they neared the falls, they climbed up onto a small mount to get a better idea of their position. High up on the cliffs was a mausoleum, the nest of two bigass Rocs. Further along the route they were taking was a shrine ontop of a taller hill, a beauty spot in the wilderness. As they ascended the winding path to the shrine, it was easy to forget why they had travelled to that far flung location. Under their feet the soft earth welcomed their adventuring soles, the kiss of vapour from the fresh waterfall rumbling just ahead of them was both cool and refreshing, what a place to have been. So much mist from the waterfall… it was like walking in the clouds. It was there that they first crossed paths with the Drow that had started the rumour about Gast, though it was not the Drow that caused much of the damage. Instead four ambush spiders lunged out of their burrows and tore great chunks out of the adventurers, the Vampire fled after being commanded to by one of Tonia's more powerful spells. It was all going according to its plan, luring them through various perils to reach its lair. After defeating their foes, they moved on to the shrine at the top of the path and Grimm rang a large ceremonial gong. It wouldn't have rung for anyone else, but for him it triggered the magical effects necessary to proceed. Where there was a single torrent, gradually there were two, the path of the waterfall became split down the middle and revealed a huge artistic door. Whether it was glass or crystal or something else, they never were quite sure of it. A trecherous path led to the door, but they avoided falling logs and slippery anklespraining doom to get there. To open the door required the use of Stunning Fist, which caused a teleportation effect on all those outside, moving them to mirrored positions inside. Not a moment too soon either, night had just fallen outside, and that's a bad time to be in the Harkness. The most nefarious trap within was a pit trap, with paralysis mold at the bottom and a crushing trap to pulp the remains of the dead. Hook Horrors had stalked the party from the moment they entered, but soon fleed when they tried to ambush and three died almost immediately. Other trials were overcome, a gaping chasm that went deep into Therafim and could only be crossed by a rope bridge was a source of some concern. The powerful winds from the chasm made crossing a dangerous task, flying was impossible, slow and steady saved them from falling to their dooms. The other side was no picnic either… Grimm noticed a trap almost immediately, right on the trail they needed to take to get to the summit of Aranea Falls. They triggered it, careful not to get any of them injured… but what about the other inhabitants? A grease trap sprung with the intent to knock people over, then a big boulder rolled down to crush any helpless victims. There was no prone meat to roll, so the boulder flew right off the side of the chasm and rocketed down into the depths. The poor Deep Dragon never saw it coming, and it was pissed off… the adventurers exited with a degree of haste before having to explain themselves. There are a wide assortment of bodies laying in what used to be perfectly maintained zen gardens, but now they're bloodied and littered with the bodies of Drow, Elves, Dryders, monstrous spiders and various other creatures of the deep along with a straggle of various other races in a distinct minority. A violet haze hangs on the ground here, you feel chills down your spine. If you concentrate for long enough you can even see the ghosts of the dead lingering over their corpses, reliving the final bloody moments of their respective lives endlessly. At the centre of this battlefield is a traditional monastery, a place of martial arts and contemplation. 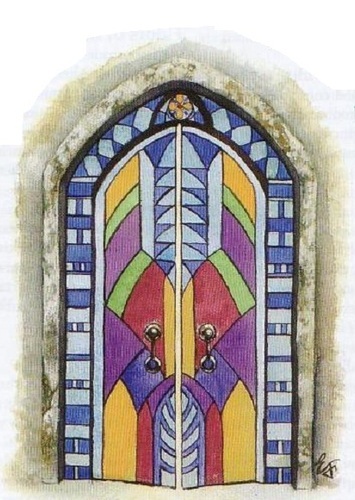 You're late to the party, the doors of the monastery are wide open, charred, splintered, it looks like all kinds of force was used before the ancient wards protecting the place finally gave in. It was here that they had their final battle. The Vampire ambushed them from out of the shadows, and its undead minions rose to aid it. The fight was bloody, a frenzy, Tonia almost breathed her last. Drow, Dryders, Vampires, and a Turos, they fought with fervor but the adventurers were not alone. The spirits of the fallen from the monastery posessed the tropiary of the zen garden, and Tropiary Guardians joined their fight. Eventually the good guys triumphed, but it was bittersweet. Defeating an elder of a Drow household is no small task to accomplish, but you have… though the victory may be bittersweet. Upon closer inspection Grimm will realize two things, the Drow was one of the murderers of his favoured 'mistress,' and the Turos that had been slain was unmistakably Gast. Most likely he was caught escaping. When they came to explore the Monastery, they found a great many treasures left behind, not to mention all of the equipment the Drow had brought with them. They also had a brief encounter with the former master of the Monastery, but for Grimm it was more personal. Upon stepping into the dojo Grimm experiences a powerful flashback, he sees the ghostly silhouettes from the gardens practicing martial arts the likes of which he has never before seen. They aren't ghosts either, but full of vigour, mostly Elves, but a few of other races are there too. As he looks around he sees the place in its former glory, it isn't long since the place fell, years only, but it has been defiled rather thoroughly. In his flashback Grimm sees the master of the monastery standing over the drill halls, an aged Elf with a long beard. Grimm will know that the students of the monastery have transcended, they have achieved what they needed to in this life. As a parting token, the grand master endows you with his beaded 'Duanda' necklace as he feels in you a great spirit for the art. You get the feeling he wouldn't object to you carrying on the long tradition of the monastery, but as someone who has achieved 'nirvana' he has no particular opinion either way. The monastery was cleared, although it was all a Drow plot some good may still come of it. The location of Grimm's surviving sibling is unknown, and although Gast is dead, there is a corpse to ressurect him if the spirit is willing to return. Approaching the wilderness where Gast was rumoured to be hiding would be an arduous journey. 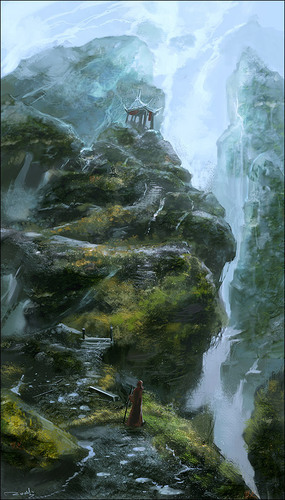 The border between Aelfheim and the Freeholds wasn't far from where Grimm had reached the surface when he escaped, and that was where you were headed. About two hundred miles from where Grimm had first breathed the fresh air of Therafim as a free Turos. Forests surround the northern and eastern fronts of the Harkness Mountain range, your destination is the Aranea Falls which is on the periphery of the Harkness'. Technically, it isn't a part of the mountain range itself, but close enough to follow the signposts if there were any. Travelling through the untamed wilderness is not without its peril, natural, unnatural, preternatural, Therafim has it all. You've entered into a muggy early summer, the air is hot and moist, an uncomfortable but not inhibiting humidity. Scarcely do you see any wildlife on the ground, but you can hear it, you can smell it, there are signs wherever you look. The sky can't be seen beyond the canopy, but it's surely there, its light cascades down through the leaves in a very picturesque fashion. Holding to your bearings you can feel the ground begin to slope steeply, not Aranea falls, but one of the hillocks before it. By this point the dust has subsided, random vegetation sticks out of your hair/fur and a kind of soft wind is tickling at your ears. [http://i51.tinypic.com/scrm11.jpg ] - Ascending the winding path to the shrine, it's easy to forget why you've come to this far flung location. Under your feet the soft earth welcomes your adventuring soles, the kiss of vapour from the fresh waterfall rumbling just ahead of you is both cool and refreshing, what a place to be. Aranea Falls is partially obscured from where you're stood near the base, so much mist… it's like you're walking in the clouds. Peculiarly, the chains resist all forms of motion except for Grimm's touch - if anyone else so much as brushes against the log it halts immediately. As the gong booms, its chime resonates throughout each of you - a feeling distinctly magical. A flight of birds take to the wing far above you, responding not to the noise of the gong, but a low rumbling at the peak of Aranea Falls. Out of sight, something is happening, the rumbling is reaching its crescendo. After overcoming the onslaught of a cluster of Hooked Horrors you ready yourselves to continue. Soon you emerge from tunnels into what must be the core of the entire peak, a wide open space that stretches far above and below you. You're stood on one side of a chasm, on the other side a tunnel appears to lead upwards, but to progress any further you will have to cross over a rickety rope bridge which jostles with every gust of wind from deep within Therafim. How to cross bridge, str check with rope tied, flying will result in pain. You reach the other side of the chasm, in spite of the cold it wouldn't be surprising to see a few of you sweating profusely. A few steps away is the tunnel you were looking for, a way to the top… [tripwire dc30spot dc24 reflex + dc10 balance grease] (grease ref dc14, balance 12) tripwire, flasks of slippery stuff. Boulder = Roar = Huge Deep Dragon, fight or flight = suggests a connection to the underdark, and perhaps explains why more things haven't attacked you if there is a link to the underdark. 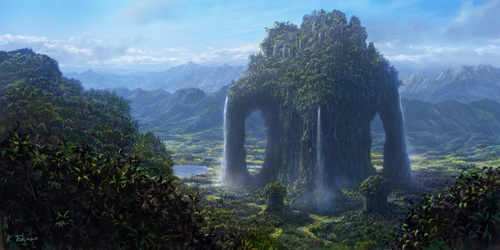 As a fell wind blows over the clearing you are reminded that the monastery remains unexplored. [Grimm Flashback]Upon stepping into the dojo Grimm experiences a powerful flashback, he sees the ghostly silhouettes from the gardens practicing martial arts the likes of which he has never before seen. They aren't ghosts either, but full of vigour, mostly Elves, but a few of other races are there too. As he looks around he sees the place in its former glory, it isn't long since the place fell, years only, but it has been defiled rather thoroughly. In his flashback Grimm will see the master of the monastery standing over the drill halls, an aged Elf with a long beard. Inside the monastery, some may experience more than others, but all of you see a defiled place. It used to be a location of legendary martial arts and a well kept secret, it is the kind of place none of you have ever even heard about before. The disembodied spirit of a bearded Elf stands before you, behind it is the corpse of Gray Linnorm. The bearded elf-spirit looks at Grimm and then disappears. Grimm will know that the students of the monastery have transcended, they have achieved what they needed to in this life. 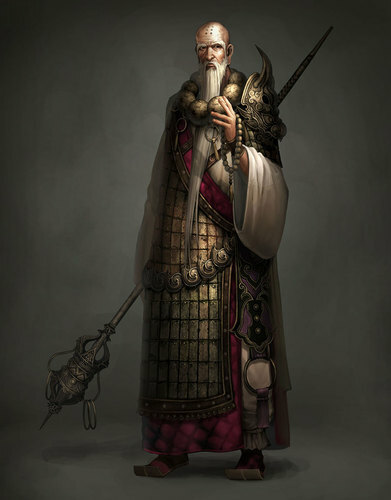 As a parting token, the grand master endows you with his beaded necklace as he feels in you a great spirit for the art. You get the feeling he wouldn't object to you carrying on the long tradition of the monastery, but as someone who has achieved 'nirvana' he has no particular opinion either way. The monastery has been cleared, although it was all a Drow plot some good may still come of it. The location of Grimm's surviving sibling is unknown, but around the Turos' neck sits the artefact beads of the grandmaster.